Tired of being ignored, attention-seeking Grief takes it upon herself to be seen. A silly exploration of the annoyance of emotions. 'One of the Fringe's greatest discoveries' **** (Everything-Theatre.co.uk). 'Think David Brent but female and fabulous' **** (FemaleArts.com). Funny Bird Productions is made up of actor/writers Lucy Alwin and Sarah Tattersall. 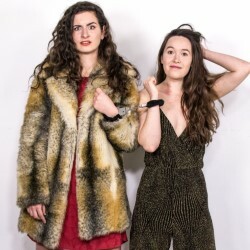 We tell funny, real, female stories in a more extreme, silly way, using a free improvisation approach to ensure that the show is a little different every time you see it.